• Поддержка Microsoft Windows 7. 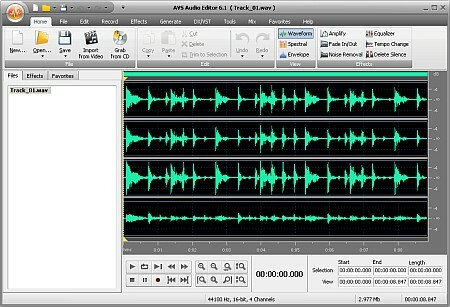 Edit your audio files with . Cut, split, merge, record, apply various effects. Save output files to all key audio formats. Over 20 built-in effects and filters including delay, flanger, chorus, reverb, and more. Full support of VST effects and DirectX filters. Use specially designed filters to remove irritating sounds like vuvuzelas, roars of football fans, hisses, etc. Blend several audio tracks, apply effects and save the output file in any popular format. Overlay your voice on audio while playing it back. It's compatible with the latest version of Microsoft Windows.